The Hoggs of Fife Bonnie check ladies shirt is a 100% gently brushed cotton blouse with a lovely contrast floral trim on the inside collar and cuffs. A semi-fitted blouse with a sculpted hem which can be worn tucked in or left out. 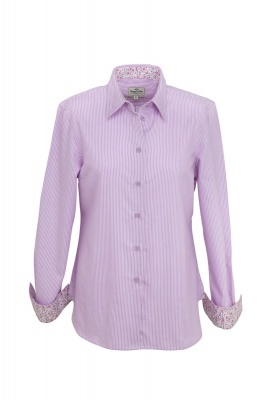 Co-ordinating coloured buttons makes this ladies shirt a fashionable shirt. A classic Bengal stripe with a floral theme. Looks great with a pair of moleskin trousers or jeans, and the Caledonia tweed jacket.